The Golf Committee is responsible for planning and hosting the annual CREW Boston Charity Golf Tournament held in the Fall. All proceeds from the tournament are contributed to the CREW Boston Educational Foundation. The Foundation awards an annual scholarship to a female undergraduate or graduate student at a college or university based in New England. In addition to the tournament, the Committee kicks off the golf season each spring with several golf-related networking events. This committee meets every 4-6 weeks for lunch between January and October. Golfers at all levels joined CREW Boston for a clinic on a cool and windy night at Granite Links with views of the city to get back in the swing for the season. Granite Link Golf Pros helped goflers improve their swing and short game. After the clinic, networking continued at the Crossing Nines Patio & Bar located between the putting green and driving range. ​CREW Boston members and colleagues enjoyed a round of golf at Wellesley Country Club on a beautiful warm and sunny fall day to benefit the CREW Boston Educational Foundation, a 501 (c) (3) endowed fund that supports the CREW Boston Educational Foundation Scholarship. Thank you to all of our sponsors and donors – and a special thanks to tournament sponsor, Schneider Electric. Over 30 women joined CREW Boston at Granite Links on a beautiful summer evening to improve their swing and short game. The participants rotated through three stations including full swing, chipping and putting while being instructed by Granite Link's golf pros. Players of all levels benefited from the clinic and became more comfortable with their golf skills. It was a perfect summer evening to enjoy the gorgeous view of Boston's skyline and network on the Crossing Nines Patio & Bar following the clinic. CREW Boston members joined forces with national golf and networking organization, Women on Course, for an evening of wine tasting and golf discussion at Fleming’s Prime Steakhouse in the Back Bay. CREW Boston members and colleagues enjoyed a round of golf at Wellesley Country Club on a crisp fall day to benefit the CREW Boston Educational Foundation, a 501 (c) (3) endowed fund that supports the CREW Boston Educational Foundation Scholarship (Scholarship). Thank you to all of our sponsors and donors – and a special thanks to tournament sponsor, Schneider Electric. 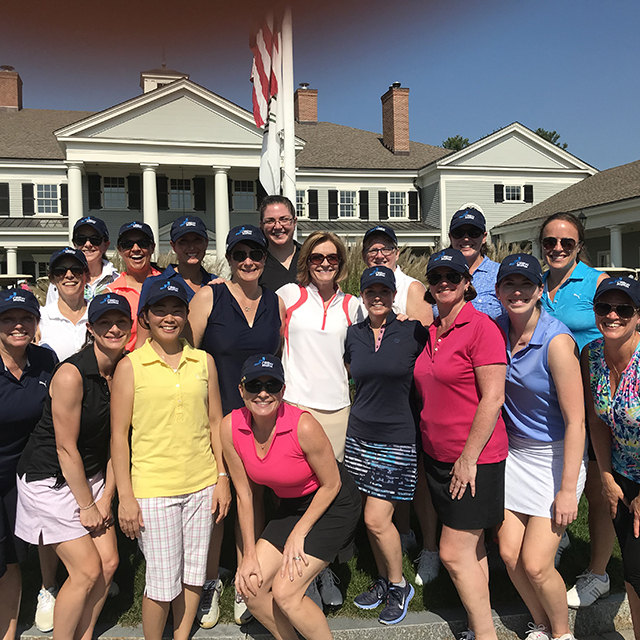 CREW Boston members joined forces with Events19 to host nine-holes of golf, followed by some lively networking, at Ipswich Country Club on Tuesday, July 19th. The weather was spectacular as players of all levels enjoyed an afternoon of golf on this outstanding Robert Trent Jones designed course. Through our various golf outings we hope to encourage members to start utilizing golf as another means of networking with colleagues and clients. And for those members who are still learning the game – to participate and become comfortable and confident in their skills. Over 25 women join CREW Boston at Granite Links Golf Club as we hosted a clinic to help improve their swing and short game. After the clinic, the networking continued at the Crossing Nines Patio & Bar located between the putting green and driving range. CREW Boston members and colleagues enjoyed a round of golf at Wellesley Country Club on a crisp fall day to benefit the CREW Boston Educational Foundation. Established in 2008, the Foundation is a 501 (c) (3) endowed fund that supports the CREW Boston Educational Foundation Scholarship (Scholarship).